Spring Grove's Rohrbaugh, South Western's Wherley and Northeastern's Yinger won district titles. HERSHEY - The memory of losses in the district title bouts last season didn't haunt Spring Grove's Dalton Rohrbaugh or South Western's Owen Wherley Saturday. The Rockets' 106-pound sophomore and Mustangs' 138-pound senior both lived up to their No. 1 seeds and ended the District 3 Class AAA tournament atop the medal stand. Rohrbaugh finished the tournament with a pair of victories by one-point margins to earn gold. 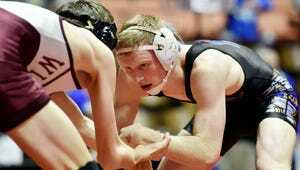 He defeated Cedar Cliff's J.J. Wilson, 2-1, in a semifinal and topped Hempfield's Jarod Loose, 3-2, in the final. Rather than letting the pressure push him, Wherley took a different approach as he left the same mat victorious. He shut out Mechanicsburg's Brayden Willis in a semifinal and built an early lead to beat Northern York's Micah Hoffman, 7-2, in the championship match. Wherley focused on being more aggressive on his feet, while Rohrbaugh felt the biggest difference between last season and this season is his ability to fend off shots and not give up points that could haunt him in close matches. Both red-hot wrestlers now look to build on sectional and district titles by winning state medals in two weeks at the Giant Center. Unlike Rohrbaugh and Wherley, who have seen teammates win district titles in the last couple years, Blaine Yinger's district title meant a little bit more to his school. Yinger's takedown in the final seconds of sudden-victory overtime delivered the Bobcats' first title since 1978 and the first as a Class AAA school. It completed a dramatic weekend. He won two matches by tiebreaker Friday, and he gutted out a 1-0 win against Issac Schannauer in a semifinal. Yinger spent the next several minutes after his win hugging friends, family and coaches who made the trip to see him make history. “I’m proud," he said. "I’m setting the example, I guess, for the younger generations, so they know if you work hard you can come out no matter how small your school is and be a district champ." A couple hours before Yinger ended Northeastern's district title drought, 113-pound senior Brandon Rodriguez ended a drought for Dover. Rodriguez, who lost in a quarterfinal Friday, battled all the way back in the consolation bracket to earn fourth place and clinch a state tournament berth, becoming the Eagles' first state qualifier since 2007. He did all that while gritting through a shoulder injury he sustained earlier this season. Fourth-year coach Brad Brosius, who has been with Rodriguez for his entire high school career, hopes Rodriguez's accomplishment grabs attention in the Dover community. Nolan Poust clapped his hands, smiled and pointed to friends and family in the crowd after pulling off a feat that seemed improbable Friday night. New Oxford's 152-pound senior, who lost to Wilson's Keaton Eidle in the tournament's first round, won his fourth straight consolation match to secure his first trip to the state tournament. He took fourth place after a 6-5 loss to South Western's Gage Thomas in the consolation final. He joins Colonials teammate Zurich Storm, who lost in the 120-pound final, as the two New Oxford wrestlers to qualify for states. Storm, who entered the match undefeated, lost to fellow undefeated Austin Desanto of Exeter Township, by a 13-6 score. It's the same opponent he lost a match to at last year's state tournament. A third Colonial just missed out on a trip to states. Heavyweight Brock Hartman lost to Central York's Michael Wolfgram in the fifth-place match. The top five wrestlers at each weight class qualified for states. Hartman did, however, earn his 100th career win earlier in the day.